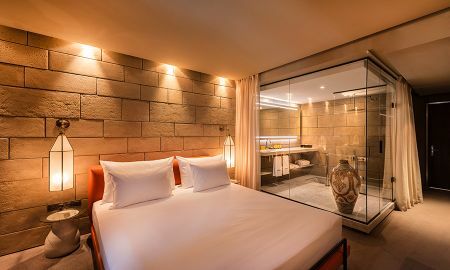 Located in Fez (Morocco), the boutique hotel Sahrai reproduces the past by meeting the needs of modern travelers coming from all over the world. This incredible hotel was designed by Christophe Pillet, whose style is based on the mixture between tradition and future trends. The ambiance reproduces the typical medina’s architecture which also creates a harmony between hotel and the surrounding landscape. 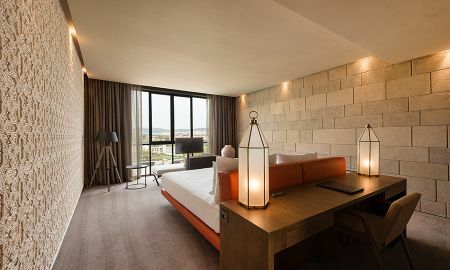 The hotel construction employed local building materials such as taza limestone, marble, wood, metal and glass aimed to create an elegant and refined setting. 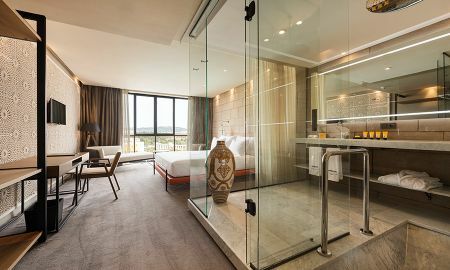 The rooms are stylish, soundproof and decorated with elegant furniture and are equipped with modern amenities for a better stay in this oasis of peace and relaxation. The bathroom also includes bathtub, make-up mirror, slippers and Acqua di Parma fragrances and accessories, ideal for demanding ladies. Located on the ground floor, the two restaurants prepare traditional dishes made with local fresh ingredients for every taste. Guests are free to choose between a wide selection of menus from the Moroccan and the international gastronomy every day. The Sahrai hotel also houses a refined pool, a tennis court and a beautiful spa by Givenchy where Jacuzzi, hammam and five treatment rooms can be found and enjoyed 24/7. The Sahrai hotel boasts an ideal situation on the top of a hill overlooking the medina and the new town. It is situated in Fez (Morocco) in a beautiful place plunged into nature where silence and relaxation can be enjoyed from dawn to dusk.